For small quantities: Mix gradually with cold water to the consistency of very thick cream, stirring well and breaking all the lumps. After mixing, the mustard should stand for 10 minutes to develop full flavour. For bulk mixing: Requirements: 1lb. 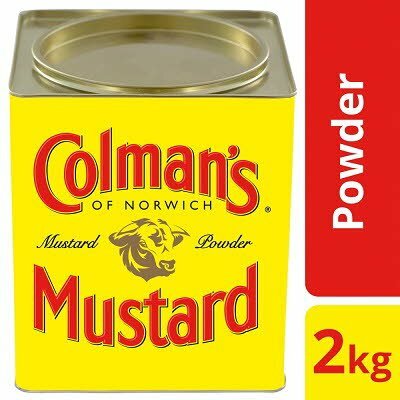 Colman's Mustard, 1 1/4 pints cold water, 1 round bottom bowl or pudding basin, 1 flat wooden spoon or paddle. Place 1lb. of mustard in the round bottom bowl and make a trench in the middle of it with a spoon. Pour into the trench 3/4 pint cold water, mix the mustard into a stiff paste, breaking up all the lumps. Then add gradually a further 1/2 pint cold water, stirring until a uniform cream is obtained.